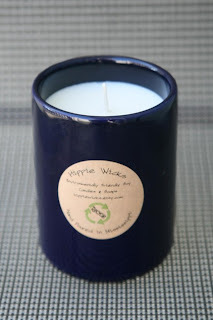 Let me introduce you to another wonderful Etsy company: Hippie Wicks. Hippie Wicks is a Long Beach, Mississippi company that creates all natural Vegan and Animal friendly candles and soaps. They also do beautiful handmade pottery. The candles are made with 100% EcoSoya soybean oil wax with no added pesticides or chemicals, and the soaps are 100% natural with only added essential oils and premium fragrances. I have been using the Lemongrass Verbena goatmilk soap that Sarah sent me for a little over 2 weeks now. I love it! The scent is a lemony sugary scent that is delicious and the soap feels wonderful. Now, I want to apologize to Sarah for taking so long to post this review (I normally post within 1-2 weeks). I was trying desperately to finish of this bar of soap and start another one before I reviewed it, but this soap lasts forever (okay, forever is a little bit of an exaggeration). My husband has already gone through almost 2 bars of Lever 2000 in the time I have been using my one bar of Hippie Wicks Lemongrass Verbena. Ttrust me, I use soap way more than he does. I have used it for everything from washing in the shower to washing my face at night before bed. I am also a little obsessive about washing my hands and I am using Hippie Wicks every time. It makes my skin feel so clean and soft without leaving a residue. It also speeds up my shower routine since it washes off quickly. This soap is far superior to other soaps I have tried (even other homemade soaps). "We take so much pride and fun hand pouring our premium soap. Not all soaps are the same. Did you know that the soap purchased at your local grocery store is not even soap? It is actually detergent and must be labeled by the FDA as a beauty bar for that very reason. Those detergents bars contain chemicals and dyes which are not healthy for your skin. We choose to use the premium goat milk, coconut oil and glycerin soap bases and add only the all natural premium fragrances and essential oils. We use just enough fragrance and oil to make sure you truly enjoy the scent yet not too much to irritate the skin. We only make the best because we use them on ourselves and our children." Sarah also sent me a Clean Linen candle to try out. My favorite thing about the candle is the stylish blue glazed tumbler that it comes in. This is a tumbler that you can use over and over again even after the candle is gone. Like the soap, the candle is lasting a long time. We have burned it several times and it is still 1/2 of the way full. I'm not a big fan of the Clean Linen scent, but I never have been. If you order a candle from Hippie Wicks you can choose your scent. There is a huge selection. I think I will try the Honey Almond for my next one. "@Latsyrc728 has a Hippie Wicks Homemade Soap #Giveaway http://goo.gl/fb/ORgk #contest (ends 3/08) please RT! " Giveaway ends 3/08/10 at 9pm EST. Giveaway is for US residents only. Winner will be chosen randomly. Winner will be contacted via e-mail and then will have 48 hours to respond before a new winner will be chosen. 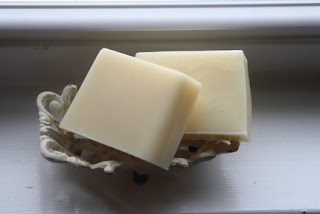 I'd like to try the Aloe & Olive Oil Euphoria Tea Tree Oil soap bars. OMG! I want the Chocolate Vanilla Oatmeal soap! It sounds fabulous. I entered the Wen giveaway. 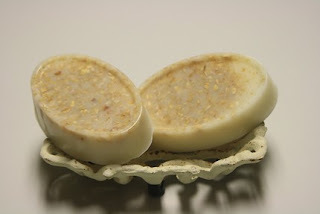 I would love to try the Almond Cherry Blossoms Olive Oil Soap Bars. The scent sounds wonderful. Became your fan on Facebook. I would like to try the almond cherry blossom soap! I would love to get the raspberry lilac soap!!! I'd like to try the All Natural EcoFriendly Aloe Vera and Olive Oil Goat Milk Buttermilk 3 lb Soap Loaf. I would love to try the sweet orange and ginger soap. i would like to try the All Natural EcoFriendly Aloe Vera and Olive Oil Goat Milk Buttermilk 3 lb Soap Loaf . I would like to try the All Natural EcoFriendly Acai Berries and Silk Oatmeal Goat Milk Oval Soap. I would love to try the Almond Cherry Blossoms soap bars. I tweeted my favorite product! I am now following your blog with google friend connect. I'd like to try the Hippiewicks Hippisticks 5 Pack Olive Oil Soap Bars 7 oz Almond Cherry Blossoms! My skin would love to be spoiled by this luscious soap! I want to try the sweet orange and ginger soap. I'd like to try the Almond Cherry Blossoms soap slice! 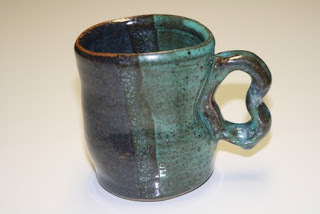 I really like the Stoneware Clay Pottery Glazed Turquoise Blue Olive Green Brown Tumbler Cup Candle Votive Holder Jar. 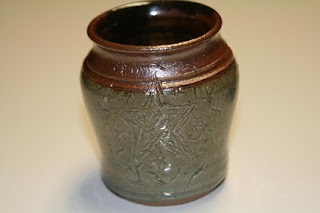 I like the Stoneware Clay Pottery Glazed Green Brown Red Jar Votive Candle Holder. As far as the soaps go I would love to try the Rasberry Lilac and I have to say with the pottery I love the Glazed Brown Khaki Speckled Candy Dish, very nice. I would love to try the hazelnut cappuchino goat's milk soap! Christina - xristya@rock.com - I'd love to try the Almond Cherry Blossom Soap Bars!